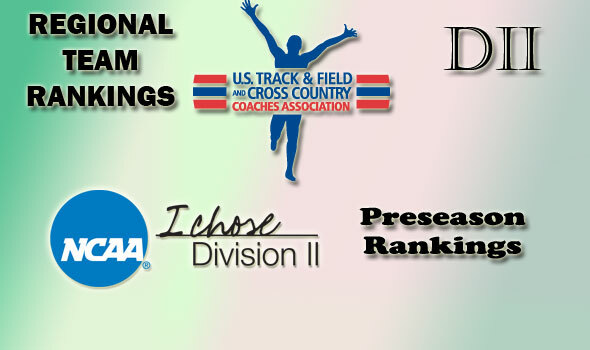 NEW ORLEANS – The U.S. Track & Field and Cross Country Coaches Association (USTFCCCA) announced on Tuesday preseason regional cross country rankings in Division II. Placed in order by a representative in each region, regional rankings are a reflection of a team’s strengths entering the year based on returning and new runners on each squad. NCAA Regional Championships will take place on November 20 or 21 in eight sites. A complete listing can be found here … http://www.ustfccca.org/ustfccca-calendar/future-collegiate-championships. The top-25 teams in the national cross country coaches’ poll in Division II will be released on Wednesday. The NCAA Division II Cross Country Championships will be held on December 4 in Louisville, Ky., at E.P. “Tom” Sawyer Park. The next regional rankings will be released on September 21. Steve Spence’s Shippensburg squad is the defending champs in the region and finished 13th at the national championships last year. Edinboro was runner up in the regional last year, but placed 12th at the national meet. The Central Region boasted the top three finishing teams at the NCAA Championships last fall, including Adams State who is the two-time national defending squad. The Grizzlies return just two of their top five runners from a year ago while RMAC rival Western State brings four of five back from their squad that was the national and region runner-up in 2009. Colorado Mines who was third at the national meet has all five of their top squad members back. UMass Lowell hold the top spot in the East to start the season. The Gary Gardner-led River Hawks was 16th at the NCAA meet in 2009 and the East champ. American International is ranked second in the region and returns now-sophomore Glarius Rop who finished third at the national meet as a freshman a year ago. Grand Valley State is the early favorite in the Midwest Region, but Lakers coach Jerry Baltes will have Southern Indiana in close view throughout the season. While GVSU notched a fifth-place showing at last year’s NCAA meet, the Screaming Eagles of Southern Indiana was sixth and enter as the second-ranked team in the Midwest. Harding returns last year’s national runner up Daniel Kirwa to their arsenal. Kirwa, now a junior, led the Bison last year to a ninth-place national finish. Florida Southern, ranked second in the region, was 22nd at the national meet in 2009. The Tarleton State Texans are ranked as the top team in the South Central to star t the season. Pittsburg State, who 18th at last year’s national meet sits second in the regional rankings. Queens University of Charlotte is the early favorite in the Southeast. Scott Simmons’ Royals won the region in 2009 and was seventh at the NCAA Championships. Columbus State returns their top four runners and was 19th at the national meet last year. King College of Bristol, Tenn., will make their Division II debut this year and have a team to watch. Chico State, led by Gary Towne, is the defending West champs and holds the top spot in the region to begin the year. The Wildcats placed eighth at last year’s national meet while second-ranked Western Washington was fourth. Shippensburg also leads the women’s region rankings out of the gate. The defending champs of the region, the Red Raiders placed 15th at the NCAA meet in 2009. PSAC rival Kutztown is ranked second in the region and was 14th at the national meet last year. Bloomsburg (Pa.), who is fourth in the preseason rankings, was 17th at nationals last year. Defending national champions Adams State is the top-ranked team in the Central region. Damon Martin’s squad will have challengers in the region which include national top-10 finishers from a year ago, Minnesota Duluth and Western State. Karen Boen’s Stonehill Skyhawks are the defending champs and top-ranked team in the East. The Northeast-10 boasts the top five regional ranked sports with Southern Connecticut and UMass Lowell falling at No. 2 and 3, respectively. Last year’s national runner up, Grand Valley State, holds the top-ranked spot and is looking for a title defense in the Midwest. GLIAC rival Ferris State is the second-ranked team after finishing 11th at the national meet a year ago. Southern Indiana, at third in the region, was 12th at nationals in 2009. After finishing in the nation’s top 10 last fall, the Tampa Spartans are the top-ranked squad and defending champs of the South Region. Harding, who graduated their top six runners from a team that was 19th at the NCAAs a year ago, still get a nod as the second-ranked squad in the region. Patty Varva’s Missouri Southern Lions are the defending champs and top-ranked squad in the South Central. After claiming a third-place national showing a year ago, MSSU has several MIAA rivals that will be gunning for a top finish in the region, including Truman State, Pittsburg State, and Northwest Misssouri. The Cougars of Columbus State holds the title of defending champs of the Southeast and is the No. 1 team in the preseason. J.D. Evisizer returns four of five to his team that was 24th last year at the national championships. Queens (N.C.) was 20th at the national meet in 2009 and will be on the radar for the region’s top spot. The West Region had four of its squads finish in the nation’s top 10 in 2009 and will once again be a region to watch closely. Alaska-Anchorage is the defending champs and top-ranked squad in the region and the Seawolves notched a fifth-place showing at the NCAA Championships a year ago. Second-ranked Chico State was sixth at NCAAs a year ago while third-ranked Western Washington was eighth nationally and fourth-ranked Seattle Pacific was fourth in the nation last fall.